This electric moped bicycle is the ultimate alternative for commuters that need a quick way to travel but do not want the expense of operating a vehicle or motorcycle. 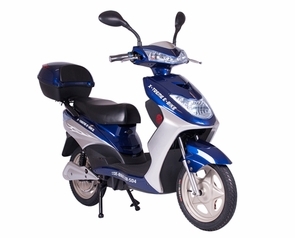 This is our top of the line Electric Moped and reaches speeds of 35+ MPH! It can be classified as an electric bicycle (since pedals can be used) but the pedals do not need to be installed and this allows it to operate like an electric moped motorcycle. You do not need to register it or carry a drivers license to operate it. Yes, this electric scooter is street legal from New York City to California! This electric scooter is loaded with features. Dual headlight system & the big 500 watt brushless motor. The power of this electric bicycle comes from the awesome 500 watt brushless rear hub motor (installed in the center of the rear wheel) that is powered by 4 large high power rechargeable batteries. The electric bicycle will travel 20 - 25 miles on a single charge. If you lose power, no problem, because you can pedal it in an emergency situation. Batteries: 4 - 12 volts 12 AMP (Four batteries total) (48 Volts). Simply plug included charger into bike. All Spare Parts Are Readily Available, But Rarely Needed! Enjoy your new bike with peace of mind. Legal Disclaimer: Trend Times.com is not responsible for the use of the scooters we sell. Please use them safely as we will not be liable for any injuries that may occur as a result of the use of these products. Children should have adult supervision while riding motorized items. Motorized scooters are not toys and require care and maintenance. All scooters are warrantied and serviced by their respected manufacturers. There are no returns on scooters. Thank you so very much. Much appreciated. Have a wonderful day!